In 1921 Minnesota made plans for a trunk highway system that included Highway 1, which would run from Iowa to Canada. 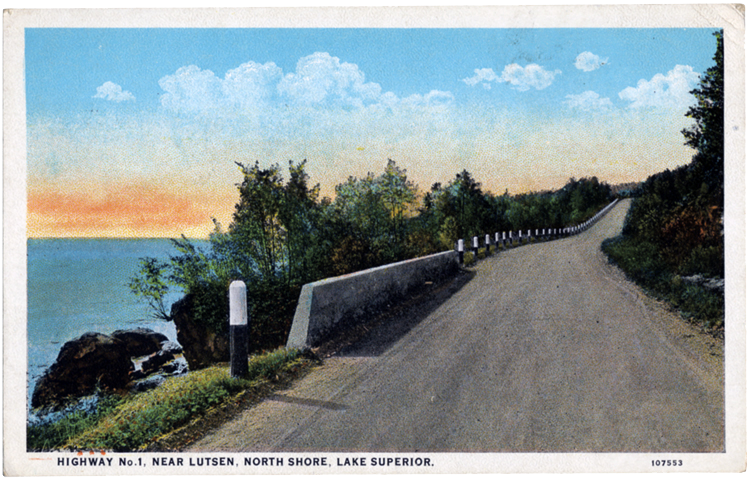 The 154-mile stretch from Duluth to the Canadian border was known as the North Shore Drive (later the North Shore Scenic Drive) and was designed to stay as close to Lake Superior’s northern coast as nature would allow. The roadway was first fully paved in 1933. It later became part of U.S. Highway 61, which reaches from New Orleans to Minnesota’s Pigeon River at the Canadian border. 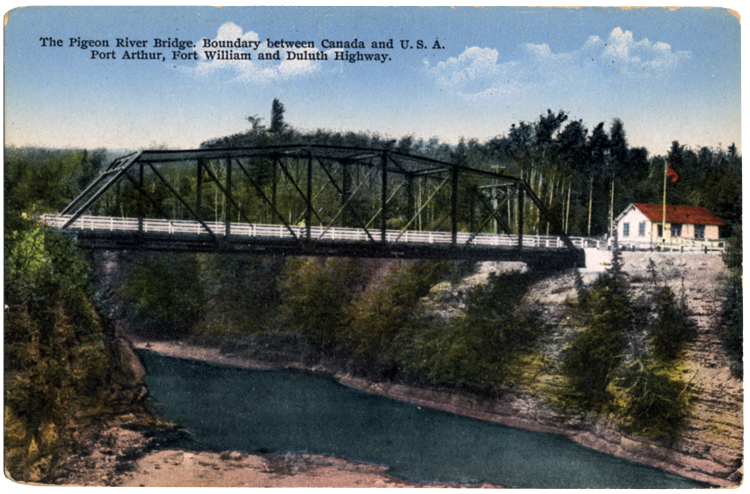 The original bridge that connected Highway 1 to Canada across the Pigeon River was called the “Outlaw Bridge.” It was financed by auto clubs in Duluth and Port Arthur/Fort William but not authorized by any U.S. or Canadian governing body. It opened August 18, 1917, and was replaced in 1934; that bridge was replaced again in 1964. A 1941 advertisement for the North Shore Drive noted that the North Shore, America’s “Summer Playground” and “Hay Fever Haven,” had no snakes or poison ivy. For years Highway 61’s most breathtaking moment was driving along the Silver Creek Cliff, formed by volcanic activity more than a million years ago. Before it became part of the trunk highway system in the 1920s, the road actually diverted inland several miles to avoid the cliff. When the trunk highway was built, workers dynamited a section of the cliff and used steam-powered bulldozers to clear the rock, which was then carried off by horse-drawn wagons. This allowed a narrow road to pass along the lake side of the cliff, forming a giant blind corner. Little more than a small barrier separated the road—and travelers—from a significant drop to the rocky shores below. If that wasn’t dangerous enough, boulders freed by erosion would often tumble down the side of the creek and onto the roadway. The excitement ended in 1994 after a tunnel begun in 1991 was finally completed. The initial plan to make passing the Silver Creek Cliff safer involved widening the roadway to keep vehicles further from the edge, but engineers estimated that would have required the removal of 1.5 million cubic yards of rock. The tunnel required removing only 500,000 cubic yards, and it’s a stunning piece of engineering: 1,300 feet of roadway with tile-covered walls and continuous lighting, plus entry façades that complement the rocky hillside. The tunnel has made the passage much safer for drivers, particularly for the thousands of tourists—most of them unfamiliar with the highway’s twists and turns—who travel the road each year. Of course, there are many North Shore residents who feel the tunnel has stripped the roadway of some of its charms. During the 1950s a family of billy goats set up home on the cliff after escaping from a nearby farm. They spent four years on the cliff, peacefully grazing for food until a bobcat killed the doe and a kid born earlier in the year. The local sheriff then shot the buck, thinking it the most humane thing to do. Further up the road Lafayette Bluff Tunnel is the only other tunnel along Highway 61. The bluff is named for the steamer Lafayette, which went down along with the barge Manila (which it was towing) during the infamous storm of November 28, 1905. From Duluth you can drive to Two Harbors quickly on the Highway 61 Expressway or you can take the slow road: Scenic 61, which hugs the lake for about twenty-two miles. One of the more popular stops along Scenic 61 is Stoney Point, a stretch of rocky shoreline along a loop of road at milepost 15. Just one mile up lies the Buchanan Wayside, marking the spot of an abandoned town named for President James Buchanan. The town, laid out in 1856, was the seat of the land office for Northeastern Minnesota. After the office relocated, the settlement disappeared. Many of Lake Superior’s tributaries empty into the big lake along this stretch, including the French River at milepost 11, the Sucker River at milepost 13, and the Knife River at milepost 18. All three rivers are known as great places to cast a line, and the French is home to the French River Hatchery, which produces walleye, herring, splake, chinook salmon, and both rainbow and lake trout. The Ojibwe called it Angwassagozibi (Floodwood River); they named the Namebinizibi or Sucker River for the fish that gather there annually to spawn. The mouth of the Knife River (Mokomanizibi or “Sharp Stones River” to the Ojibwe) is also the location of the village of Knife River, which was platted in 1899 to serve the Alger- Smith Lumber Company’s railroad. Russ Kendall’s father opened a smoked fish house there in 1924 after his truck broke down, forcing him to sell his smoked fish from the side of the road (Russ still smokes his own fish). In Knife River you’ll also find Emily’s Deli, originally opened by Emily Erickson (who emigrated from Norway when she was 12) in 1929 in a building that was once a general store and post office. Like much of the North Shore, the stretch along Scenic 61 is dotted with cabin resorts, motels, and restaurants—many of which have come and gone. The Fish Fry Lodge was found on the site which is now the McQuade Safe Harbor, and the Elmgren Motor Court was found just west of the Fish Fry (it is now the Gardenwood Motel). 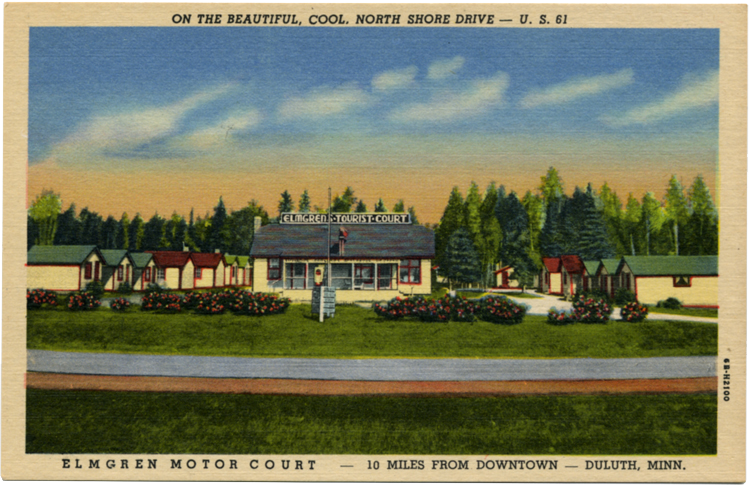 The Loneyville Motel (which apparently featured a miniature farm), was located in the township of Larsmont, a few miles west of Two Harbors. The community was formed during the 1880s to serve a large logging operation, but didn’t receive its name—for Larsmont, Finland, from which most of its setters hailed—until 1914. By then fishing and farming had become its chief industries. The House of Sweden, found just west of Two Harbors, was built by Walt Grant in 1946 and only served food from his native Sweden. The restaurant added motel rooms in the 1960s, and Grant sold the place to Tony and Marge Radosevich in the early 1970s; they converted it into the Earthwood Inn, which still operates. A portion of Scenic 61 is actually Congdon Boulevard, named for Chester Congdon, whose estate paid for the property on which the road was built. 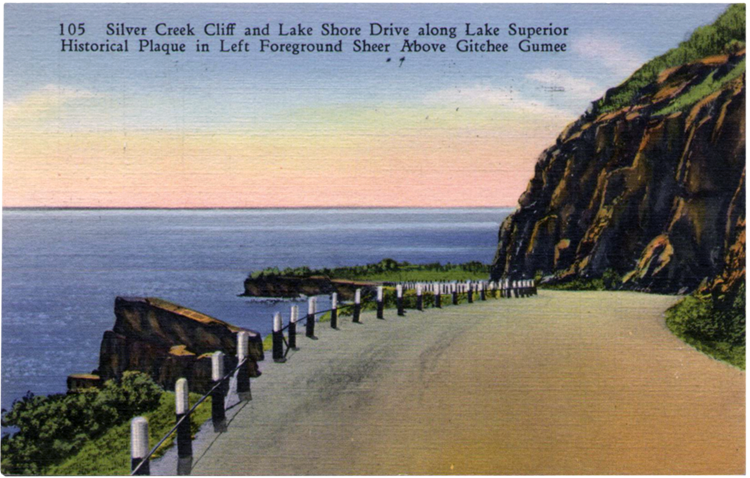 It was Congdon’s idea for a scenic highway from Duluth to the Canadian Border. You can learn more about Congdon’s connection to Highway One / Highway 61 / Scenic 61 in the “Kitchi Gammi Park & Congdon Boulevard” story here in the Parks & Landmarks index.